When we drive visitors from social media and other sources to our website, they are all at various stages of the buyer journey. Person A: They are not following you but they see an update reshared by a fan on Facebook. This links to a blog post on your website. At this stage, they have never heard of you before and it’s their first time visiting your website. Person B: They are loyal followers and may have even bought a product off you before. They see a link to a blog post and visit your website. We’d call ‘Person A’ a cold audience and ‘Person B’ a warm audience. Both are very different, so the information we share and how we communicate with them should be different. To deal with the complex world we are in today, we need to rely on automation to help us. 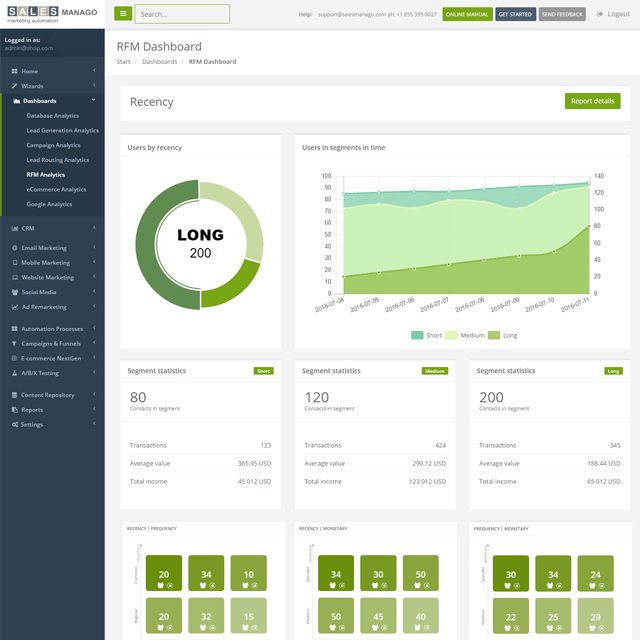 Automation is essential to improve the experience of the user interacting with us and also improve the possibility of us generating sales (or more sales). 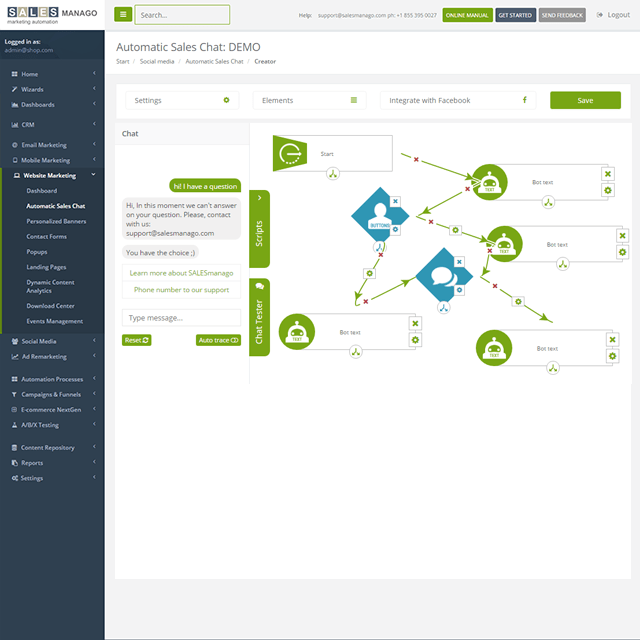 In this article, we take a look at some of the advanced automation that is provided by one of the top European marketing automation providers, SALESmanago. Their advanced automation capabilities will give you some ideas of what you should be looking for in your automation tools. It’s important to recognize the difference between a customer, a prospect and a normal visitor to your website and treat all of them differently. The following image splits out prospects, partners, clients and others. When you isolate out the traffic, you then build content on your website and follow up with communication/offers that are tailored according to the relevant segment. See the next point! 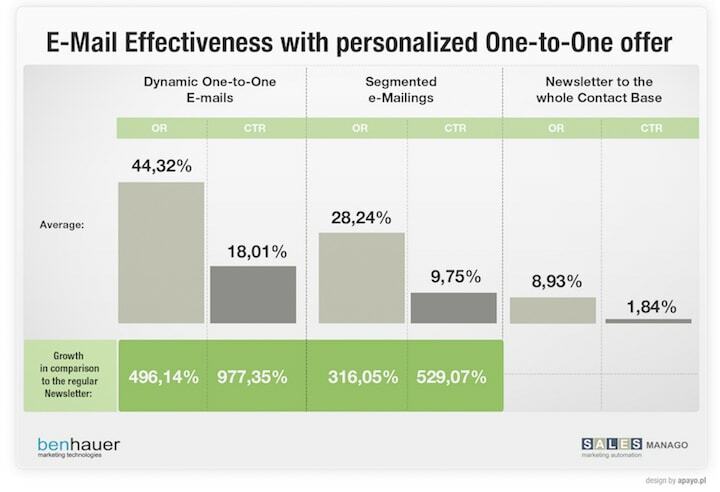 We’d like to get to a stage of personalizing all our email communication specific to the users’ needs. This is not always possible but wouldn’t it be nice to do it when it is possible? So how is this achieved…? 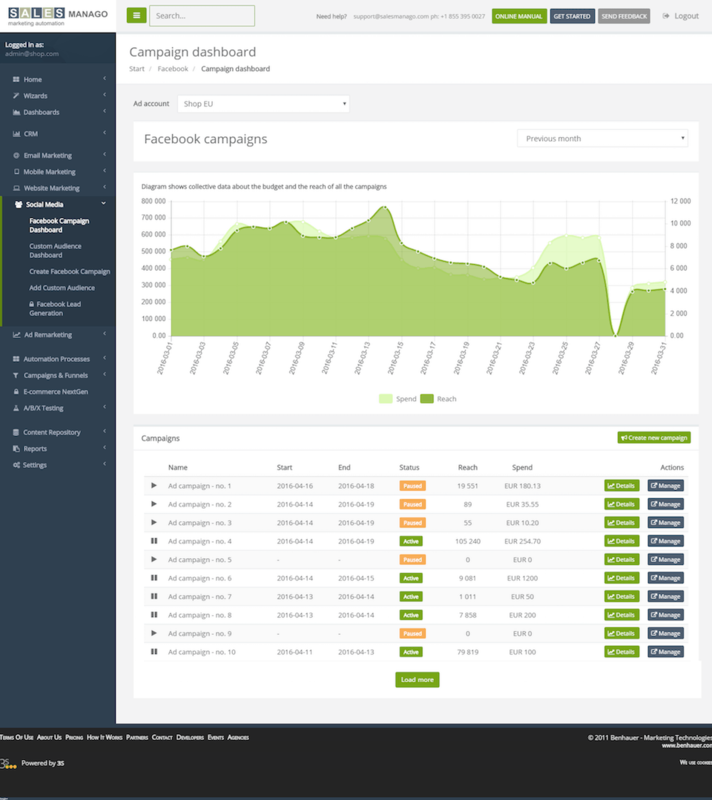 The system tracks user behavior on your website and creates individual behavioral profiles that can be supplemented with any transaction data (i.e. did they buy stuff?!). The system will then go through the product database to find a product that is suitable based on their behavior and then it will dynamically add this information to a email to be sent out. For example, if they previously bought a $100 product and they are browsing a page with 10 products, they can be sent an email promoting other products on the page within the same price category that they didn’t buy previously. Or you could email them with products they recently viewed that have recently been given new prices. As your visitors are increasingly visiting your website using their mobile devices, it’s important to consider how you integrate in a mobile environment. Using an app (e.g SALESmanago’s), you could start tracking behavior within the app and then generate personalised messages based on this behavior (in-app messages, SMS, emails etc). Which parts of the app is the user focussing on? Where are they leaving the app? etc. As well as the app, you could also build full profiles based on their behavior while browsing the mobile website and come up with suitable offers. I think that Facebook Messenger will be increasingly be used for customer service but also potentially for customer sales. When someone is looking to check up their flight status or order delivery status or they want a solution to a problem etc., they will increasingly use Facebook Messenger. At the last Facebook conference, they announced the support of bots, which enable you to automate a lot of the conversation to save you time. Sales Manago have created a bot but what makes it interesting is that it saves interactions from Messenger to its profile, which is typically built up from their website behavior and from email communication. Also, when a user provides their email address through Messenger, the bot can alter communication based on their previous profile history (e.g. recommend relevant products). …would it be better to show them details of a new product that is related to what they previously bought? The majority of sites show the same information to every user. But it is possible to tailor the information. With SALESmanago, you can detect that it’s a customer and remove any email opt-in and replace it with product offers! 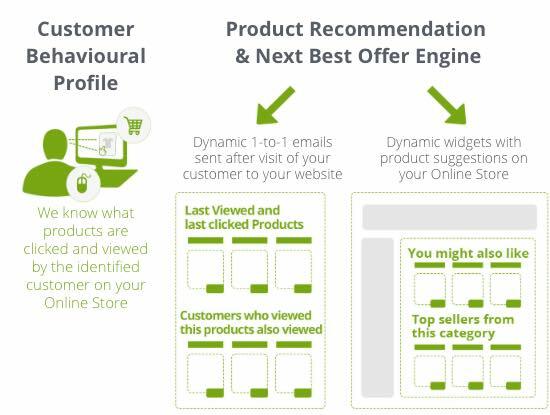 The eCommerce recommendation engine creates dynamic emails based on customers visiting your website. 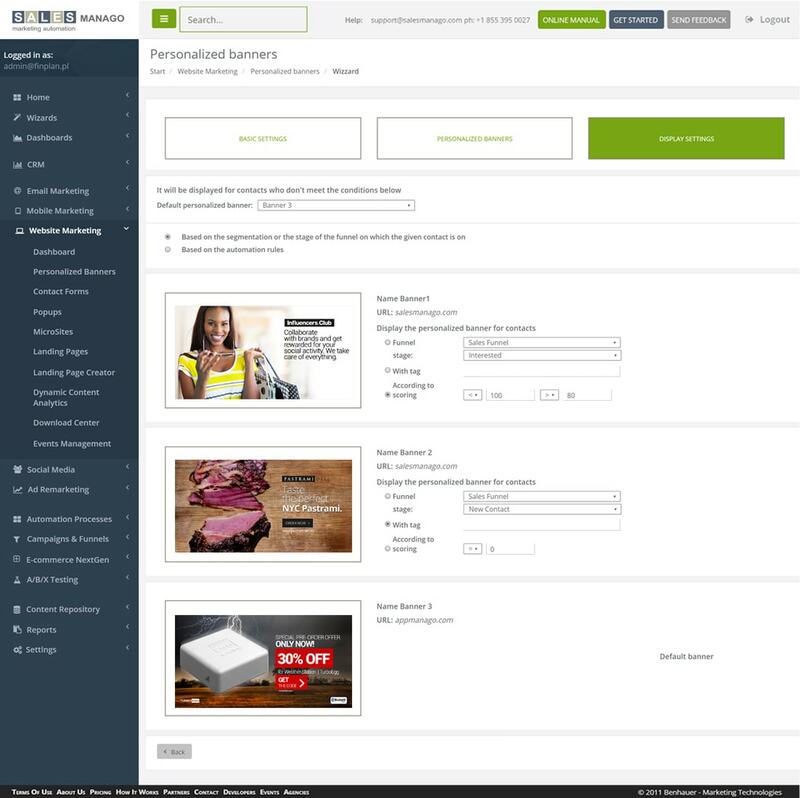 It also creates dynamic product suggestion widgets on your online store, based on the customer. 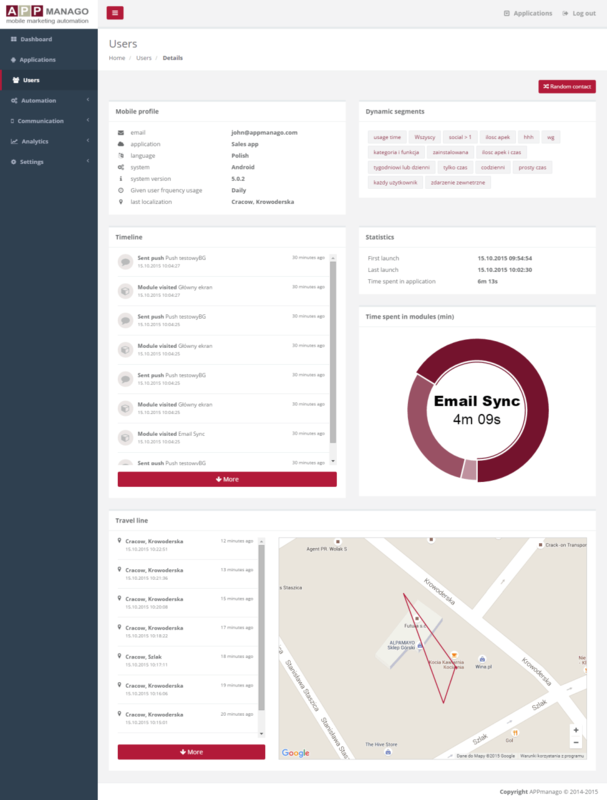 Dynamic means the email or widget is generated after you assess the customer. This type of profiling helps to increase sales as your offers can be specific to the customer in question. You know their purchase history, the type of products they buy, and what they typically spend. You know that personalising recommendations is going to increase sales but quite often we don’t have the tools to do it. When someone visits your website, you can automatically add them to a custom audience on Facebook based on their behavior. You can then subsequently create and track the ad with SALESmanago. Create a custom audience of everyone who has bought a product and target them with an upsell (i.e. another product). Create a custom audience of someone who goes to the ‘buy now’ page but drops out of the funnel. Your ad can target this custom audience with a better offer for the product. We need to think about social media as part of our overall marketing solution not a separate island. This level of integration helps. 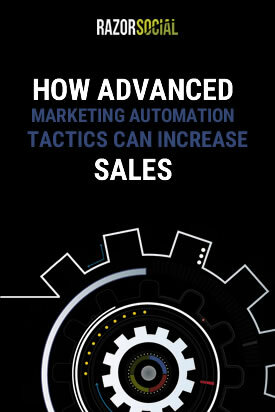 Most marketing automation platforms are focussed on B2B and are not really designed for B2C environments. When you are in a B2C environment, you want to know more about recency of purchase, frequency of purchase and monetary value. Using a combination of this information can help product-targeted segments where you can create relevant offers. SALESmanago call this customer value marketing. By providing RFM-based information, online stores can increase the average value of their customers. 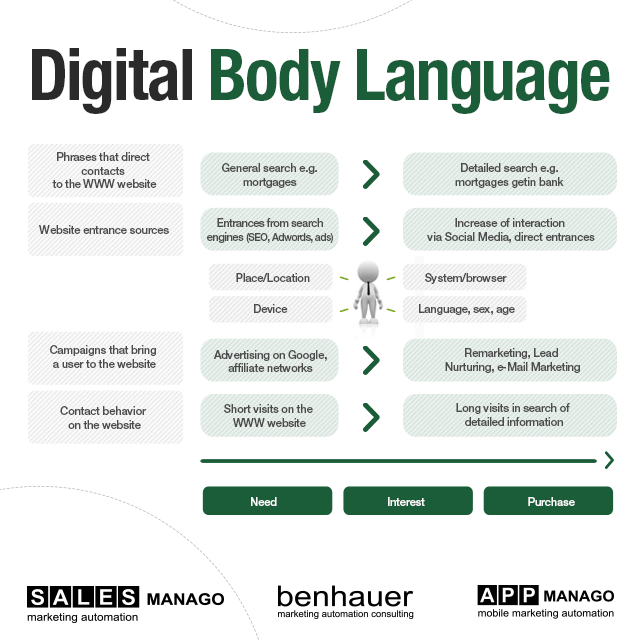 Not to be confused with beacon technology that sends personalized communication to you based on your location, the SALESmanago web beacon technology tracks your interaction on a website. Imagine if you had a one-page website and you wanted to create personalized communication based on the parts of the page they visited. If you have buttons on a web page, it is important to tailor communication based on which button they pressed (i.e. they showed an interest in specific products). This is the SALESmanago web beacon technology. But they also integrate with actual beacons so it can transmit information based on their proximity to a beacon and then communicate based on this information. The days of blanket advertising is gone. People want personalised communication where you present them with content that is as relevant as possible. Marketing automation helps with this personalisation of communication. In this article, we have demonstrated how SALESmanago uses advanced functionality that takes their product to the next level.